Just wanted to show you some more of Kath's work and say thanks to Kath and everyone who came along to make yesterday a fabulous day, Kath was a hoot as usual, and her work is just amazing as you can see. I even dusted off my desk and started creating last night so she must of been good as my "mojo" had definitely left the building!!! If you didn't make it along yesterday check out Kath's blog and her gorgeous canvas fully of Tim Goodness! Not been to your shop yet. Would have loved to have come yesterday, but I am laid up with pulled ligaments in my ankle. Maybe the next one I will manage to. Not been out to your shop yet. Would have loved to have come yesterday, but I am laid up with torn ligaments in my ankle. Maybe I will make it to your next one. Beautiful samples Jacqui, I'm glad you all had a great day. Hi Jacqui, thanks very much for a fantastic day with Kath yesterday. 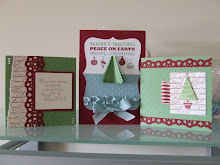 She's a great demonstrator, so generous with her hints and tips on how to make fabulous cards. Thanks also for your generous hospitality. I think we all appreciated the coffee, sandwiches etc very much. And of course the opportunity to buy some great products. My friend was at work so I think we will probably try to take a trip to Alford sometime soon. Thank you again Jacqui for another great day. There is always such a lovely atmosphere (along with so much gorgeous stock) when entering your shop. My thanks also to your friends for sharing their talents.